The 57th Venice Biennial is running until November. With, this year, a French principal curator, Christine Macel, and Golden Lions for Anne Imhof at the German Pavilion of the Giardini and Franz Erhard Walther at the Arsenale Corderie. Among the multiple exhibitions, here is a selection. The French artist Xavier Veilhan wants to spend most of summer 2017 at the French Pavilion. 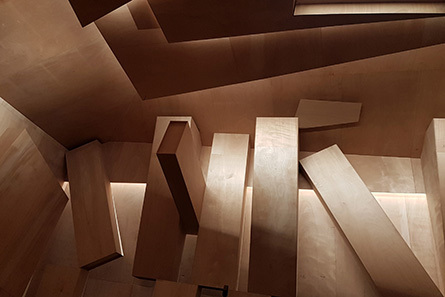 He has entirely redesigned its interior architecture, referring to the resolutely immersive work of Kurt Schwitters. And he wants to be as close as possible to the musical creations that emerge. Because his "Studio Venezia", which looks like a "Merzbau", is none other than a functional recording studio. The idea of steps of work is a reoccurring theme in the work of this French artist, at least in the low resolution of the facets of his sculptures ; every one of them appears in a form of assumed unfinished state. The artists invited to Venice, composers or performers, therefore pass through, depending on the various temporalities. They will leave again with the audio and video recordings that belong to them, while the studio could migrate to other horizons. The audience attends these moments which are so specific, when the works reveal themselves to the world. More than outcomes, some processes of creation, in their extreme fragility, are expected, in the sharing. The feeling of joy that inspires the title of this Biennial, "Viva Arte Viva", seems to be in rupture with the seriousness of some national pavilions, such as Lebanon’s and its return to Venice. 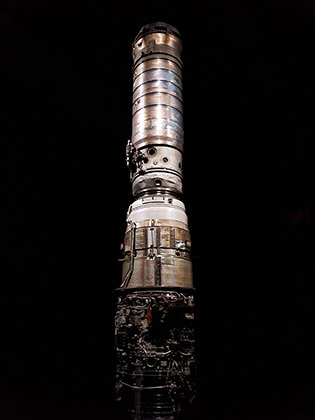 Where the composer and artist Zad Moultaka, by the light, stages the Rolls-Royce jet engine of a bomber, as a totem. The work entitled "SamaS" was inspired by the stele of the "Code of Hammurabi" and the 150,000 coins that cover an interior wall recalls the Byzantine mosaics of Saint Mark's Basilica. When hearing some extracts of the "Lament for the destruction of Ur": "Children sleeping in their mother’s lap, are swept away by the waters, like fish", we obviously think of other ruins, those of Aleppo, and to other children, the ones of Syria, along the border with Lebanon. And the Lebanese artist that lives and works in Paris reminds us that civilizations, whatever they may be, carry their own destruction. History, in these worst moments, tirelessly, repeats itself. “Meals are universal necessities that transcend borders, classes and religions", says the artist Lee Wan of the Korean Pavilion. At the entry of his installation "Proper Time", the latter has displayed the mathematic formula which allows him to calculate the value corresponding to the time of work that is necessary to buy breakfast. 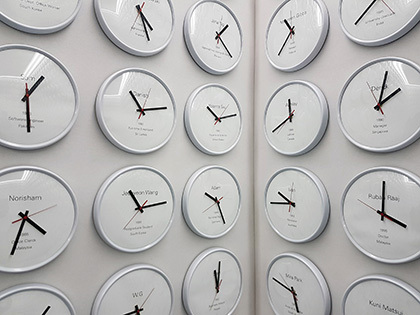 The clocks that cover the entire room are personalized with the names of those the artist interviewed. The rotation speed of the hands, indexed on the meal time values, have temporalities that are proper to them. Time, concerning their desynchronized movements, would therefore be less universal than it looks. We then think of the science-fiction movie "In Time", directed by Andrew Niccol, in which people's lifetimes are proportional to their wealth. Life expectancies, in times of peace, relate to the difficult working conditions; both vary according to social class and to geographic areas around the world. 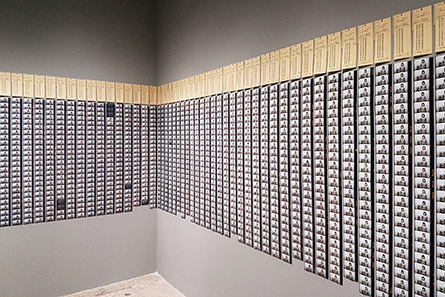 If there are protocol works, that artists literally inflict on themselves, the one entitled "One Year Performance" that the Taiwanese Tehching Hsieh experienced for a whole year is one of them. For the latter has forced himself to the endeavor of photographic self-portrait. But it is the action of clocking in with an extreme regularity that guides our interpretation of this resolutely performative work. Sometimes, he has failed. But the “punch” cards that come with the myriads of his photographs are here to demonstrate, in red, the color of the mistakes. His work clothes are also displayed, under glass. Repetition, in art, is common practice. Pushed to the extreme, in this very case, it shows the determination of the artist to denunciate alienation by the work when the tasks are particularly repetitive and the workers have not yet been replaced by robots. Let us remember that the term robot comes from the Slav “robota” for labor. And that labor, nowadays, is also digital for those whose work time, at home, is automatically remotely controlled by servers. Julian Assange expressed himself publicly on May 19th from the balcony of the Ecuadorian Embassy, in London, where he has been stuck for five years. The fact that this whistleblower founded Wikileaks, whose mission consists of broadcasting blocked content, is obviously in relation to this diplomatic reclusion. And that is what it is about in the Russian Pavilion of the Giardini where the artists Andrey Blokhin and Georgy Kuznetsiv of the Recycle Group bring up a form of digital censorship with the "Blocked Content" installation. One must not trust the soft whiteness of polygonal structures, because they imprison some other possible whistleblowers, hackers or activists. All are frozen in their ongoing actions while the labels do not suggest more (gender, age, activity, reason of the blocking). This installation refers both to those who are incarcerated and to the content which some powers would want to keep. It is very well a form of contemporary censorship that is being discussed here, a censorship which we do not exactly know who are the censors, the States? or the data companies? There are guards, as everywhere else in the Arsenale or in the Giardini, at the entry of the HyperPavilion initiated by Philippe Riss-Schmit. 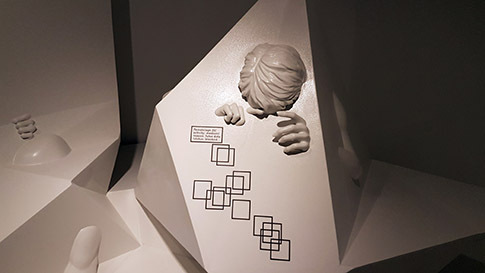 But these are particular, in the way that they check the Facebook profiles of the visitors that take part, initially involuntarily, in the artistic performance "Weeping Angels" that Aram Bartholl carries out in the form of an installation inside. Because a Facebook profile, according to this German artist, "is seen as much harder to fake or lose than a passport". And we must concede that the data that matches us, at some point, is likely to betray us. 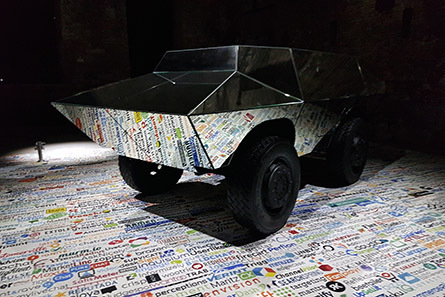 Aram Bartholl has covered the ground with a carpet with thousands of international data company logos on which he has placed an anti-riot vehicle completely covered with mirrors. This relationship between personal data and security forces is at the center of many concerns. We remember the exchanges opposing Apple and the FBI, demanding the unlocking of a smartphone. But what do we actually know of the transactions between digital companies and intel? Are digital companies able to resist both pressure and profit? It’s doubtful. “What Shall We Do Next? Finally, and again at the HyperPavilion, there is a video creation entitled "What Shall We Do Next? (Sequence #2)". Julien Prévieux, the author of this filmed performance, has organized it around gestures that the digital companies patented. This way, with these innovations to come, they anticipate our gestures as well as our uses. So it is a legal framework that underpins the choreographies that six dancers execute together while a voice-over telling some descriptions, such as, the way they come with the patents. We then think more about the considerable number of the Natural User Interface gestures, of the translation or the rotation or the scale that will never meet their audience. Like the ones, such as the unavoidable pinch to zoom opposing the thumb to the index finger that have become so familiar to us. 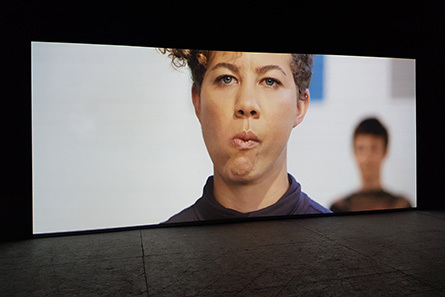 Actresses and actors of Julien Prévieux's movies are deprived of any technical objects; their gestures are aligned with the invisible, like mimes. Incessantly, they replay gestures again and again, of which we possibly still ignore the meaning and that, for some of them, will greatly take part in our habits to come. Written by Dominique Moulon for ETC MEDIA and translated by Garance Moulon, May 2017.